This is my first podcast with Andrew McMinn enters his eighth season as head coach at Robert Morris University, part of a team that has excelled on the field and academically in his presence. I found this coach to be passionate, creative, and the kind of coach players would love to play for. He has been at RMU for 14 seasons altogether now, beginning his tenure as an associate head coach during the program’s second season in 2006. In 2018 Robert Morris went 13-5 with big wins over Marquette, Penn State, Bryant and the thriller game versus Maryland in the NCAA DI Tournament. In 2017, the men’s team at Robert Morris made its fifth Northeast Conference Tournament in history and fourth under McMinn. A second NEC Coach of the Year award was bestowed upon him and the NEC Team Sportsmanship Award upon the program for the first time since his first year at the helm. Seven Colonials earned all-conference selections, and JonPatrik “JP” Kealey became the 20th alumnus drafted into the National Lacrosse League. In 2016, McMinn led the Colonials to their fourth overall NEC Tournament appearance and third of his tenure. He saw five players earn All-NEC honors, and added two RMU alums to the pool of eleven who were competing at the professional level in the NLL at the time. 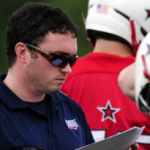 Prior to being named head coach, McMinn had previously as the associate head coach for the Colonials. He had served on the Robert Morris staff for six seasons, helping RMU develop from its earliest stages as a program to one that had secured three consecutive winning seasons and a national ranking along with its first postseason berth in the two years prior to his appointment as head coach. McMinn progressively earned additional responsibilities within the Colonial program the years leading up to his appointment, including aiding in the hiring and management of other staff members and overseeing certain budgetary matters. He also represented Robert Morris as a speaker at the USILA national convention in December 2009, where he led a presentation on transition offense. Before joining the Colonials’ coaching staff, McMinn was a standout goaltender for the Providence Friars of the Metro Atlantic Athletic Conference (MAAC). In three seasons as the starting goaltender, he helped lead his team to two regular-season championships, a MAAC Tournament Championship and a berth in the 2004 NCAA Tournament. He was a three-time All-MAAC selection, a 2004 MAAC All-Tournament Team honoree, and he held the top two single-season goals against average marks in MAAC history at the time of his graduation. During his career, he ranked among the top goaltenders in Division I in both save percentage and goals against average. He ranked fourth nationally in GAA in 2003, allowing just 6.91 tallies per game, and was seventh nationally in save percentage in 2005 with a .599 mark. McMinn earned his Bachelor’s degree in management with a minor in finance from Providence in 2005. He completed his Master’s degree in instructional leadership with a concentration in sport management from Robert Morris in 2014. In the Preview below for all free members, we get an awesome practice philosophy to reinforce transition lacrosse, I recommend you listen to the free Preview, I chose this portion of the full podcast as it is an incredible concept.